Today, guest blogger Guigen Zhang, professor of bioengineering at Clemson University, talks about his new textbook on computational modeling for biomedical applications. This blog post discusses Integrative Engineering: A Computational Approach to Biomedical Problems, including its content and the intended readers; the purpose and motivation for writing this book; and most importantly, how getting an in-depth understanding of the “intricate machinery” of computational modeling will help make you a better modeler. Integrative Engineering: A Computational Approach to Biomedical Problems is based on my years of firsthand experience in teaching computational modeling of multidisciplinary problems with the motivation to encourage transdisciplinary learning, integrative thinking, and holistic problem-solving. Hence, the textbook reflects the ideas I have developed over the years in my journey of searching for a practical tactic for updating engineering curricula and making it relevant to our time. I developed this book in the spirit of encouraging integrative learning, questioning, hypothesis testing, problem-solving, inventing, designing, and prototyping. I also want to encourage learning and researching by linking commonalities across compartmentalized disciplines based on the underlying mathematics, in order to generate novel solutions and cultivate a sense of limitless possibility in engineering research and industrial R&D activities. In a way, this motivation has something to do with COMSOL Multiphysics®, a software I started using quite some time ago. I still remember my early reluctance toward using this so-called equation-based modeling software. At the time, all of my previous finite element modeling (FEM) experiences gave me an impression that seeing equations is what a program developer needs to do. A program user would not need to concern him/herself with this. COMSOL Multiphysics® was the FEM program that forced me to see the underlying governing equations. The more equations I see, the more I find commonality in the governing equations for different physical phenomena. This has led me to believe that an integrative engineering approach based on multiphysics modeling is possible. For example, in one chapter of the book, I detail the procedure for the development of differential equations for different engineering problems — including mechanical, heat, mass transport, and wave propagation — to demonstrate that differential equations can be of the same mathematical type, even though they govern problems of different physics. This highlights the fact that for countless real-world problems, we may only need to deal with limited types of governing differential equations. Because of my adaptation of this equation-based concept, the book is not like any other book on FEM and biomedical applications, although it discusses procedures used in the finite element method. It introduces a computational modeling approach based on facilitating integrative learning through consolidating commonalities in various disciplines and gaining a deep understanding of how this “intricate machinery” of computational modeling operates. This book is written for undergraduate and graduate students in engineering and applied sciences, as well as practicing engineers in industry and R&D labs. As a valuable resource for finding and formulating solution ideas from complementary fields of engineering, this book will be useful not only for novice modelers, but also experienced simulation engineers. Examples of computational models for biomedical applications. An image-based modeling example for a denture with and without reinforcing wires (top) and a CAD-based modeling example for a spine fixation device (bottom). Part I presents the rationale for converting from a compartmentalized disciplinary to a transdisciplinary approach in education and argues for promoting integrative, rather than reductive, learning. Part II provides a systemic discussion of the hands-on details of computational modeling procedures. Part III discusses the environments of common modeling software and explains the connections between software settings and engineering fundamentals. Furthermore, methods to develop hands-on practical skills in performing computational modeling, practical issues concerning image-based modeling, as well as the standardization and regulatory processes are discussed. Part IV provides useful knowledge in mechanics of materials and mathematics for “just in time” learning and referencing materials. The textbook aims to lay down some groundwork toward what will be a long journey of restructuring the engineering curriculum with the assistance of a computational-modeling-based investigative tool. In future editions of this book, more integrated problems will be presented and discussed as case studies. What do I mean by restructuring the engineering curriculum? In most universities, an engineering curriculum is a four-year program. When we talk about encouraging students to embark on transdisciplinary learning, we often encounter the argument that we are producing “jacks of all trades and masters of none”. In this book, readers will learn how an integrative engineering approach assisted by interactive computational modeling can help not only reduce many of the redundancies in the existing curricula, but also provide meaningful visualization of scientific principles at work in real-world applications. Furthermore, readers will also learn the difference between learning how and learning that, which especially helped solidify my vision for a new engineering curriculum. In my belief, it will surely make a big difference in readers’ views toward learning, too. The idea of going beyond learning that and learning how is key to incorporating relevant humanities content in engineering curricula. Doing so will help train engineers who are not only technically competent, but also conscious of social needs, so that they can innovate not just for technological pursuits, but also for humanity. With an integrative approach, we will be able to do R&D in a much more effective and scientifically guided way, rather than the traditional trial-and-error way. The book discusses domain discretization using various elements in detail. You will learn about shape function developments using Lagrange interpolation formulas for a full spectrum of Lagrange elements (you will not find this feature in any other books) including 1D bar elements, 2D rectangular and triangular elements, 3D hexahedral and tetrahedral elements, and using Hermite interpolation formulas for beam elements. The origin and meaning of the two interpolation formulas are also included in the book. Turning integration into multiplication using Gauss quadrature: A case of 3-point Gauss quadrature. 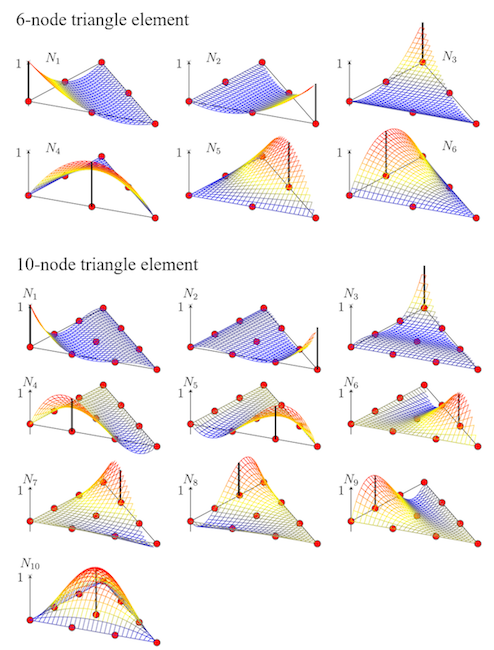 Shape functions for 6-node quadratic and 10-node cubic triangle elements. Quadratic elements use second-order polynomial equations for domain discretization and cubic elements use third-order polynomial equations for domain discretization. A plane-stress situation (left) versus a plane-strain situation (right). 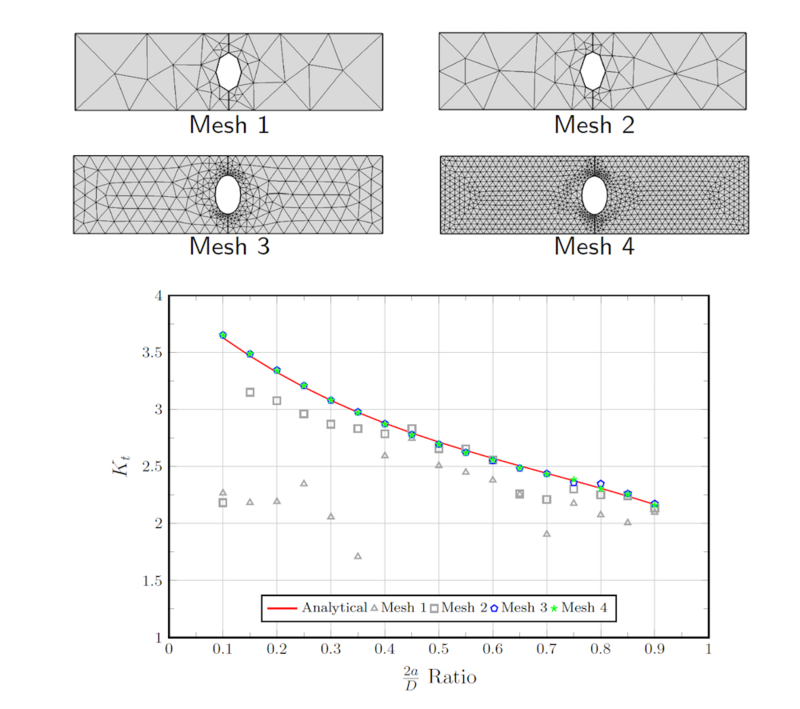 Mesh refinement is crucial for obtaining converged modeling results. 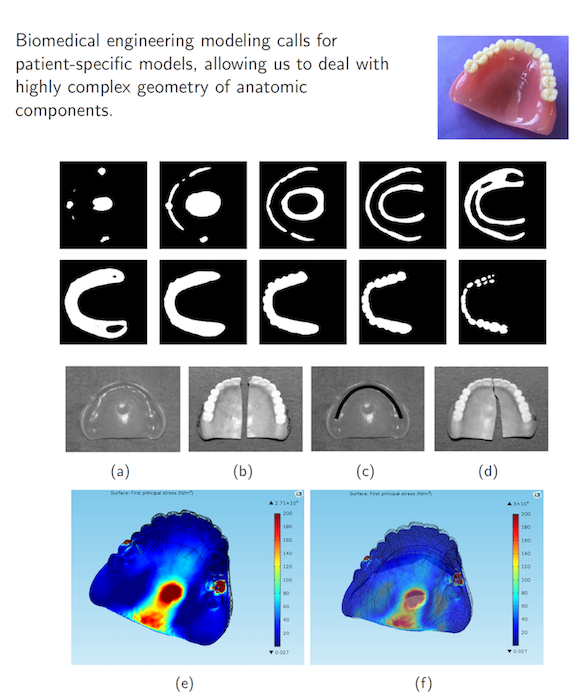 In addition to these important fundamentals, real-world modeling problems are also discussed, like the denture and spine device models pictured in the first section. Through hands-on experiences gained by problem-solving assignments in the process of learning how, students will see not only the feasibility, but also the practicality of solutions in a holistic way by taking advantage of computational tools. With this approach, real-world problems in a variety of domains, either individually or combined, can be dealt with in a transdisciplinary way. 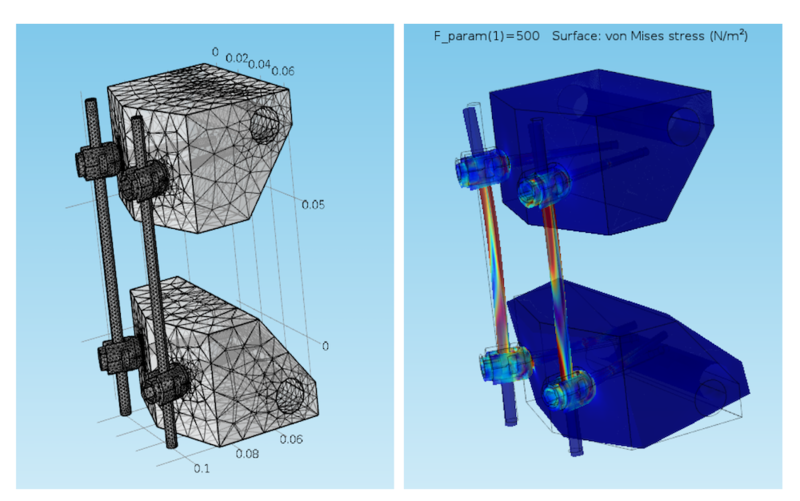 For COMSOL Multiphysics® users, getting an in-depth look at the “intricate machinery” of computational modeling and its operations will certainly enhance programming skills. 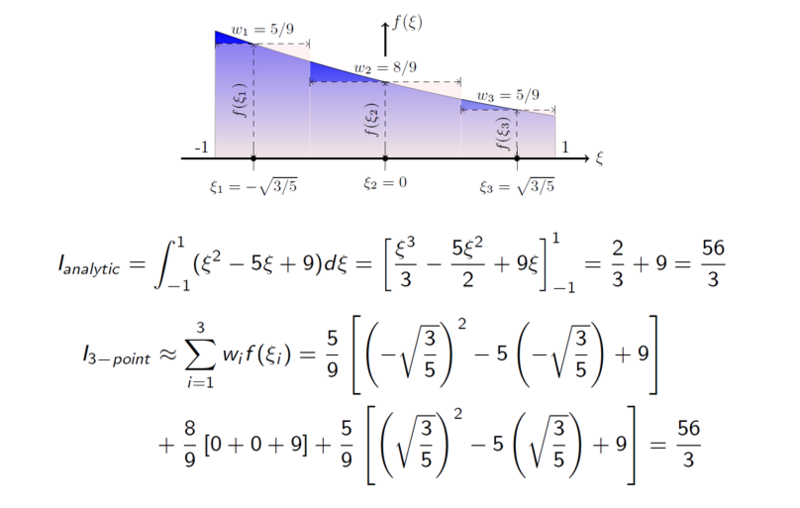 To make it more interesting to study, I also strive to add artistic beauty to graphic illustrations throughout the book by creating them myself using mathematical equations with open-source-code LaTex and the companion packages such as TikZ and PGF. This allows me to show the physics and engineering concepts from a teacher’s perspective. 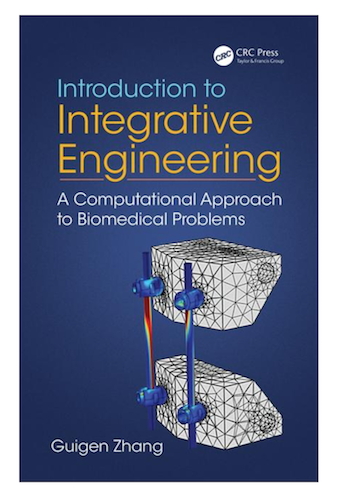 To learn more about Introduction to Integrative Engineering: A Computational Approach to Biomedical Problems or to purchase the book, click on the button below. Guigen Zhang is a professor and associate chair of the Department of Bioengineering and professor of the Department of Electrical and Computer Engineering at Clemson University. He is a fellow of the American Institute for Medical and Biological Engineering. 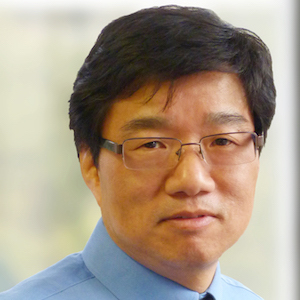 Dr. Zhang has been invited to serve on expert review panels by the NIH, NSF, and other U.S. and Canadian agencies on subjects covering nanotechnology, biomaterials and biointerfaces, biotechnology, sensors and biosensors, nanoscale drug delivery, the neurotechnology nexus, and bioengineering research partnerships, among others. He has also been a keynote and invited speaker at numerous national and international professional conferences, including the Venture Conference in Switzerland and the OECD Conference in France. Professor Zhang is also active in serving prominent leadership roles in professional societies. He is currently the executive editor of the Biomaterials Forum of the Society For Biomaterials and president of the Institute of Biological Engineering.